In the early 17th Century, the Palatinate was repeatedly ravaged by attacks from France. Following a harsh winter, notices were tacked up by American landowners enticing them to emigrate to America, and a substantial exodus of Palatine families occurred in 1709. Some of these emigrants went directly to America, but thousands were routed through London because wealthy Irish landlords hoped to increase the Protestant tenant population, a goal supported by Queen Anne of England. On July 7, 1709, the Council of Ireland, a committee of ten Irish gentlemen-landlords proposed to the Queen that a number of Palatines be sent to Ireland to strengthen the Protestant cause. Upon the Palatines’ arrival, they were temporarily lodged in Dublin and received an initial small subsistence. Then they were distributed by lottery in lots varying in size from one to fifty six families to forty three other gentlemen-landlords who settled the Palatines on their lands with the agreement they would receive favorable treatment. The Commissioners mandated that should any Palatines refuse the contracts offered, they would be deprived of receiving “Her Majesty’s bounty.” By January of 1710, 3,073 Palatines (533 families) had been relocated to rural Ireland, with a roughly equivalent number being transported to New York and North Carolina. The lands set apart for the Palatines were assigned to them at easy rates, often at a third less rent than other tenants were paying, which caused hard feelings among the local community. Some of the Protestant German-speaking settlers claimed to be victimized by hostile neighboring Catholics, and over the following three years, more than two thirds of the Irish Palatine settlers left Ireland and returned to England, some hoping to eventually go to America, and many even hoped for an eventual return to Germany after peace came. By February of 1711, only 188 of the 533 Palatine families remained on the lands allotted them and 300 had gone to Dublin to seek other work! However, one Landlord successfully managed to induce his allotment of Palatine immigrants to remain in rural Ireland. 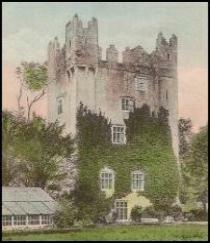 Sir Thomas Southwell of Castle Matrix near Rathkeale, County Limerick (shown at top of page) championed the settlers’ causes and took care of many of their initial needs at his own expense, being reimbursed only just before his death in 1720. The town was already well established when the refugees arrived there in 1709. In 1711, only 10 families were left there, but by 1714, Southwell had managed to settle about 130 families on his lands, and the region around his estate has retained the largest concentration of Irish Palatine residents to this day in Killeheen, Ballingrane, and Courtmatrix. There are nearby Palatine cemeteries and Killeheen Lane, where 27 Palatine families lived and farmed while their cattle grazed on common land in the early 18th century. Castle Matrix fell into ruins, but was later restored by an American. In 1758, Methodism’s founder, John Wesley, visited the forty Palatine families at Castle Matrix and, finding them without pastors, quickly converted them to Methodism. Seventy years later, there were three villages with about 70 remaining Palatine families. The Palatine farmers still clung to the concept of a common cattle grazing ground for the settlements (dorfs), and had a burgomeister for decades. They also appear to be the first to build silos in Ireland, and they had prosperous farms. They retained their language and customs as late as 1830, and by 1840 it was said that they could still be distinguished from the Irish population by their names. However, at the end of the nineteenth century, there was no trace of a German dialect left in the Palatine settlements, and their German names were mostly changed in form. By the 1930’s, most Palatine descendants, having intermarried with the Irish and English, either had no knowledge of their origin or denied it and, in any case, only 700 of them were still living in Limerick County. Today, there is an Irish Palatine Association there, and although most settlers eventually emigrated to America and lost all traces of their true heritage, at least one descendant still farms there, continuing an unbroken family tradition for almost 300 years.